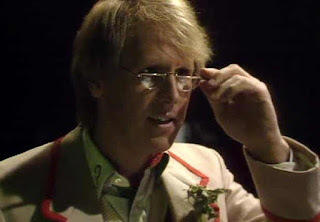 Peter Davison's part of season twenty one ran from January 5, 1984 to March 16, 1984. It contained twenty episodes across six stories. Season twenty one was another year of rapid change toward the end of the season. For the first time since season four we have a regeneration in the middle of a season. This season also experimented with turning a four-episode story be turned into two 45-minute episodes with Resurrection of the Daleks. We say goodbye to Tegan, Turlough, Kamelion and the Fifth Doctor all within consecutive episodes and we pick up a new companion in American botany student Peri Brown. This season carries the interesting reputation of having what is probably the greatest single story of the entirety of the Classic Show which is immediately followed by the single worst story of the entirety of the Classic Show. We'll see the good one this week and the bad one next week. The first story is Warriors of the Deep and it's four episodes long. The Doctor decides to show Tegan something of Earth's future and lands on Sea Base 4. Unknown to the members of the base, a battle ship of the Silurians is nearby and is reviving members of the Sea Devil race. 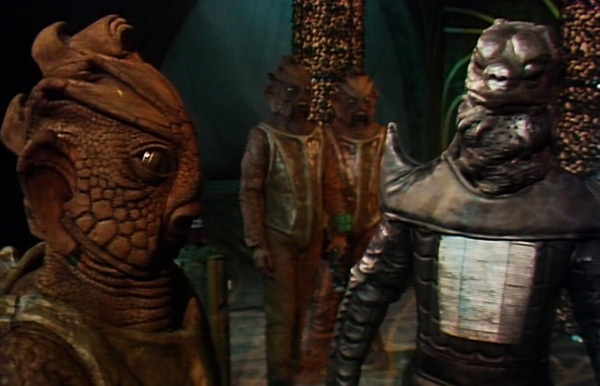 The Silurians and the Sea Devils attack Sea Base 4 with a large marine creature called the Myrka who kills everyone in it's way. 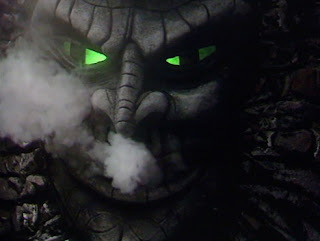 The Silurian's plans is to cause the humans to destroy themselves by triggering a global war. The Doctor tries to find any way to stop the Silurians and Sea Devils but when they will not sway he ends up using a toxic gas that is lethal to all reptilian life. The Doctor, Tegan, and Turlough along with the sole survivor of the Base leave in despair though they saved the world. This is quite frankly terrible. The only good thing I can say about this story is that the Sea Devils have donned a sort of Samurai outfit which looks nice. Everything else about this story is a train wreck. There were many production issues with this story and it was almost not made; I'm not convinced that they made the right choice. The outfits were bad, the Silurians looked silly, the lighting was poor, the story didn't have enough substance, and the Myrka suit was one of the worst looking and laughable things I've ever seen. I know what they were trying to go for and if they'd had another script re-write, more money and no production problems this could have been good. As it stands...no this is very bad. The next story is The Awakening and it's two episodes long. The Doctor has decided to take Tegan to see her grandfather in 1984, but when the TARDIS lands in a decrepit church and a boy wearing 17th century garb, they question where they've landed. It turns out that the village in which her grandfather lives is doing a sort of English Civil War reenactment but things are getting far too serious when Tegan's grandfather is locked up, people are being kidnapped, and the leader is requesting the murder of the Doctor and Tegan. It turns out that a creature known as the Malus, a giant face stuck in the wall of the church, has been psychically controlling the leader of the war games and is feeding off the psychic energy of the people causing them to obey and turn on themselves. The Doctor, with the help of a couple people in the village and an actual 17th century boy who accidentally ended up in 1984 break the Malus' hold on the people and eventually cause the leader to fall into the mouth of the Malus destroying both and freeing the village. Many of the two-episode stories aren't that great but this one is the exception. In fact the only really negative thing I can say about this story is that it's too short. It honestly might have been better if it were a three part story and allowed the plot to breathe a little bit. There is SO MUCH crammed into this story that I didn't even bother to mention and I'm not entirely sure how they were able to fill these two episodes with so much content. Why? Despite the shortness and the amount of material, this is neither confusing nor a massive cluster. Somehow it just works. It's short, the villain is threatening, and everyone is doing a fantastic job. Check this one out! The next story is Frontios and it's four episodes long. The TARDIS lands on the planet of Frontios where the last remaining group of humans are barely surviving due to constant meteor bombardment, lack of supplies and the fact that members of their party keep going missing. The Doctor helps the injured out but after another meteor bombardment it appears as though the TARDIS has been destroyed leaving behind only the Doctor's hat rack. As another member of the humans is dragged into the Earth, it is discovered that the cause is a group of insect aliens known as Tractators and their leader, the Gravis. 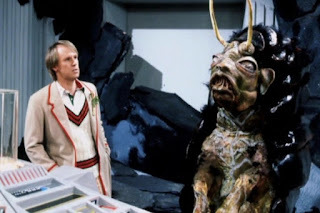 The tractators, with their powers over gravity, have effectively destroyed the TARDIS and intend on using the humans to power mining machines to transform Frontios into a space ship so they can destroy other planets via gravity. Tegan, Turlough, and the Doctor find parts of the TARDIS stuck in the rock walls and eventually finds what is left of the console room. 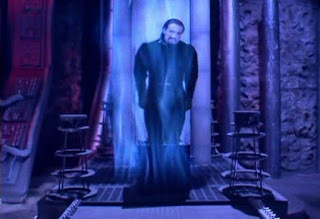 They trick the Gravis inside and cause him to use his gravitational powers to reassemble the TARDIS. This cuts him off from the Tractators leaving him immobile and the others harmless. The Doctor dumps the Gravis off on a deserted planet and leaves the humans to rebuild their society. Most people enjoy this one fairly well but it's lost on me. For a story about the TARDIS being effectively destroyed, this one sure is boring. It's probably the single most boring Davison story there is. I'm fairly certain I've fallen asleep watching this one as well and that's a shame. Bug creatures controlling gravity and dissembling the TARDIS should be one heck of a story but it's just not. Come to think of it... exactly HOW did the Gravis destroy and reassemble the TARDIS using gravity when it's clearly stated in Tom Baker's era that the inside of the TARDIS is in another dimension?? Bah who knows. You may not find this as boring as I have but I still don't recommend it. The next story is Resurrection of the Daleks and it's two 45-minute episodes long. The TARDIS lands in London 1984 where they discover the Daleks have made a time corridor to a ship in the far future. The Daleks, working with a man named Lytton, are attacking a prison ship that's holding Davros in suspended animation. It seems that the Daleks have lost their war with the Movellans because the Movellans developed a virus that would kill Dalek life and they need Davros to come up with a cure for it. At the same time they are making duplicates of people on earth to take over the planet and intend on making a duplicate of the Doctor, Tegan, and Turlough in order to take over Gallifrey. 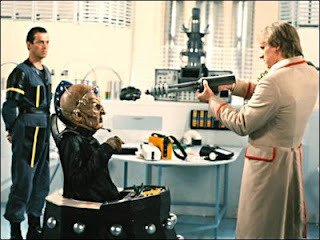 Davros, however, is having none of this and begins creating his own army of people and Daleks who are only loyal to him. A battle ensues between the humans, the Daleks loyal to Davros, and the Daleks loyal to the Surpreme Dalek. With no other choice, the Doctor opens up a canister of the Movellan Virus and kills all of the Daleks in the area which potentially included Davros. Due to the bleak nature of their travels recently, Tegan decides to leave as it is the proper time period for her. Resurrection of the Daleks is an odd one in the fact that the episodes are 45 minutes long. This story is pretty dark and it has the highest on-screen death count of any episode of Doctor Who. It's got an interesting story and struggle going on, but the death overshadows anything else about this story. You can't really blame Tegan for not having any fun anymore. So far this season we've had a story were almost everyone dies, a creature that feeds off violence, almost ending the human race, and all of this death. This is a pretty good story that I can recommend. The next story is Planet of Fire and it's four episodes long. The Doctor and Turlough are taking a vacation on the island of Lanzarote when Kamelion starts to mess with the TARDIS console and is mentally taken over by the Master once more. At the same time a young girl named Peri finds a strange artifact in the ocean that resembles the mark on Turlough's arm which is transmitting a signal. The Doctor traces the signal and heads off to the planet Sarn. While on Sarn, Turlough meets with another man who has the same mark as him and due to that marking may, in fact, be his brother. Turlough reveals to the doctor the truth about the marking and how his family were exiled after a revolution. The Master uses the controlled Kamelion to assist in taking the Master to the rejuvenation flames on Sarn. The Master was meddling with his tissue compression machine and it backfired causing him to be only a few inches tall. Eventually Turlough realizes the nearby volcano will destroy the colony and calls his home planet for help. Elsewhere, the Master is ready to be healed, but the Doctor turns the flames to another setting on him and he seemingly dies. The Doctor then obeys Kamelion's wishes and destroys the robot. The Doctor and Peri go to pick up Turlough but he has decided to go to his home planet instead. This one's just ok. I skipped a bunch of stuff about some god the people worshiped and how the people with the mark were seen as chosen ones and so on because it ultimately didn't matter that much. This sees the departure of Turlough and the arrival of Peri. It's sad to see Turlough go because he was such a unique companion. Peri, however is one of those companions who was popular at first but then the fans turned on her and I'm not entirely sure why. She's pretty great! This story is kind of odd. Check it out if it seems interesting. The last story of the Davison era is The Caves of Androzani. 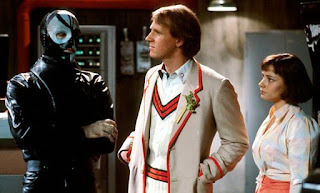 The Doctor and Peri arrive on the planet of Androzani Minor where they get involved in a struggle between a large corporation and an underground madman who is obsessed with beauty. The mines on Androzani Minor are filled with the components to make a sort of life serum to keep people young for as long as they have the solution. Unfortunately both the Doctor and Peri have contracted spectrox toxima and are slowly dying. The only cure for this disease is the milk from a giant bat that lives in an area deep underground without any oxygen. Things continue to get more complicated as a group of renegades start pushing the Doctor around and everyone ends up separated. Eventually the Doctor escapes and finds the bat but there is only enough antidote for one of them. He instantly and gladly gives it to Peri, regenerating as soon as he does. This is an absolute must see. This is the strongest episode of the Davison Era, 1980's Doctor Who and quite possibly the strongest story of the Classic Era all together. Yes, it's that good. I know I didn't go into great detail on the story but that was mostly out of respect and wanting you to watch this. This story is near perfect. The cliffhanger at the end of episode 3 is one of the greatest in the show's history. There is nothing bad I can say about this story. You have to see this one, you'll be glad you did! Thus ended the Peter Davison Era. His part of this season was rough for me. I feel as though I should probably enjoy some of these stories more than I actually do. Maybe you will see something better than I have but for my money, The Awakening and the Caves of Androzani are the only really good ones this season. If I'm being honest, the whole of the Davison era just sort of blends together with only a couple of really stand-out episodes. It's not as though the stories are the same it's just that it sort of melts into one giant mediocre blob of stories. I have nothing against the Fifth Doctor or his era but it's just mediocre. We do get to see the Fifth Doctor one last time but that won't happen until the Tenth Doctor's era. Please join me again as we continue to examine all of Doctor Who.